So a couple of week back I started the “Hot Right Now” series and kicked it off with New Look. For the second installment I’ve chosen River Island because my god do they have some epic pieces in at the minute! First up, is this check longline shirt. I’m a massive fan of checked shirts and this one looks like it’d be really easy to wear over leggings for a super casual look or pulled in at the waist with a belt and a nice pair of heels for something a bit more dressy. Available online for £28. Another pretty basic piece, but I can’t get enough of stripes! I’m even wearing a long sleeved striped top as I write this blog post, oops? Again, super casual and easy to wear, a perfect wardrobe staple for this time of year for layering looks! Available for £18. Let’s talk hats. When I finally land myself a new job, there are so many things that I want to treat myself to with my first pay cheque and one of those things is definitely going to be a new hat. I think the dark purple one is my favourite of the two, although the black one will go with absolutely anything. Which do you prefer? Both hats are available online now and priced at £28 each. I’m not the most stable lady in wedges but these lace-up caged ones are bloody gorgeous! Perfect for all year round really, pair these with a little white dress in the summer for a smoking hot evening outfit or with some black skinnies and a loose fitting blouse and blazer in the winter for a super smart day to night look. Available now online for £55. I’m fairly sure that I’ve mentioned watches in every other post recently. This one is deffo the most glam to appear on the blog as of late. As I know I’ve mentioned many a time, nothing quite compares to a Michael Kors watch, but this bad boy is pretty gorgeous if I do say so myself and it’s only £35! No need to damage the bank account with a schmancy watch when there are gems like this on the high street! The 13 year old emo kid inside me is screaming, buy the dress, buy it! Ya’ll know that I love a bit of lace and when it’s an entire dress made up of the stuff, well I couldn’t just ignore it could I?! I basically just can’t get over how beautiful this Victorian-esk dress is.. and it’s only £45! Not bad for limited edition River Island aye. I might just have to add this to my list of things to buy when I land myself a job! Cape’s are all the rage at the moment and it’s taken me a while to find one that doesn’t just look like a coat that I already own. This pink tartan faux-fur trim one is something really different for me but I adore it. It’s something that I reckon my mum would probably see me wearing and think.. hmmm, i’m not too sure about that one. As styled on the website, I think it’d work perfectly with a seemingly boring monochrome outfit through the cold wintery months. Grab it now for £40. Another limited edition item are these heeled Chelsea boots. Another great wardrobe staple that’ll do you all year round! Snap them up online for £40. Last but not least is this open backed button-up shirt. Admittedly, anything open backed isn’t ideal for autumn/winter, unless you’re inside and the heating’s turned up to full whack, but this shirt is hella cute front and back. The open back makes for a bit of sexiness and the gold buttons on the front give it that extra bit of jazz. I suppose you could look at it a bit like mullets.. business in the front, party in the back and all that. Grab it online for £28. 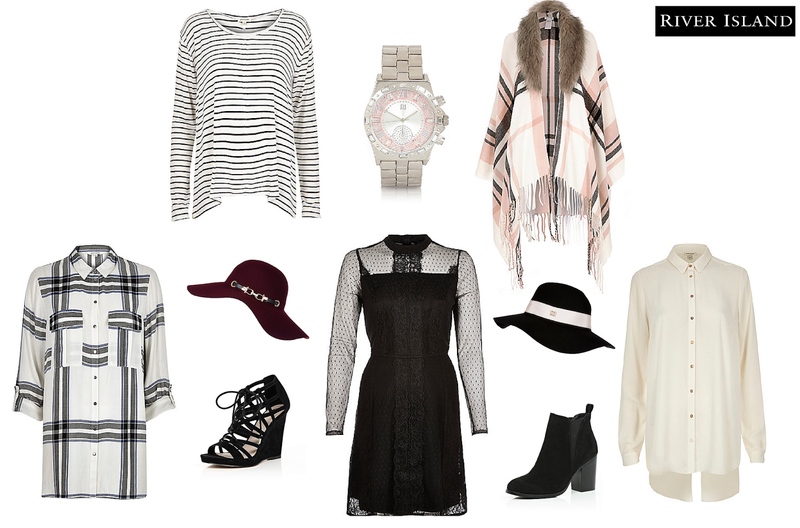 So those are my current top picks from River Island right now! What’re you loving from River Island right now? Let me know!